Sales training has long been one of the hardest things to evaluate, both before and after the meetings take place. Founders and CEO’s want their sales team to be excellent at their jobs, as sales meets the bottom line directly on the balance sheet. Hiring a top sales speaker for your next meeting is very important. High energy presentations that educate, inspire and move people to action are key to growing your bottom line. Most sales teams have potential, but there is a real gap between potential and results that can be difficult to navigate. Thom Singer is a top sales speaker who has an eclectic background in sales and marketing. He spent two decades earning his living as a producer before joining the ranks of motivational sales speakers. Singer is the right choice for your sales kick off meeting. As you look for the sales speaker for your event, put Thom on the short list. Those in sales management who plan meetings usually talk to three or four keynote speakers before making a decision. Much as your professionals have no chance of making the sale if they are not on the “Short List”, Thom is clear that he has to have conversations in order to close deals. 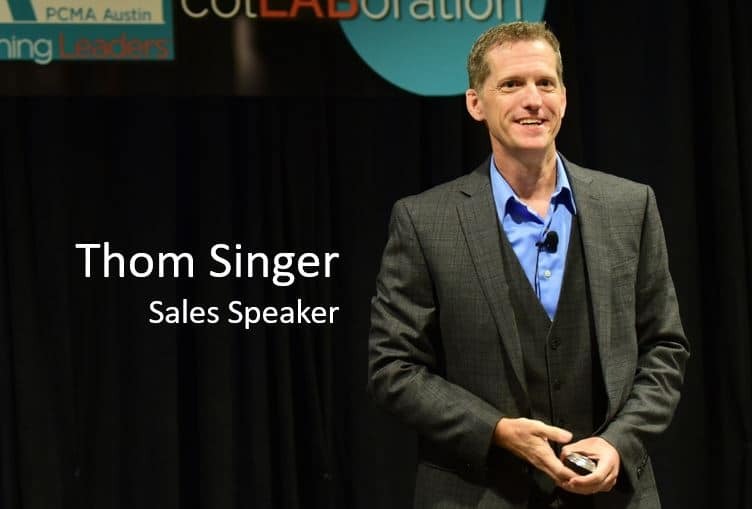 Why Thom Singer as Your Sales Speaker? Thom Singer is an award winning speaker who has also been a successful sales professional. If you are seeking a sales speaker – look no further. He is a best-selling author who understands that speakers and CEO’s have a lot in common. He started his own speaking and training company in 2009 and has come to understand the pressure of entrepreneurship. The success of all business is tied to a fundamental sales strategy and winning sales. We are all in sales, and that means sometimes you lose deals – even opportunities where you feel you are the right solution. This is why sales motivation is important; If you are not losing some of the time you are not talking to enough prospects. Thom is the sales speaker who will get your team looking at the whole path between potential and results. In our “social media crazy world” there has been a lot written about using social media to sell, but for most industries that not going to get you to your quota. But social selling does not work for most sales teams. You need to have the human engagement and a commitment to the customer experience. Few people buy important services from a social media “like”, “link”, “share” or “follow”. While many can and should use social media to help grow their brand (if their clients and competitors use social media), it is not magic. 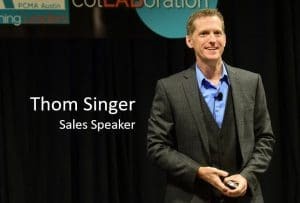 Thom Singer is a sales speaker who works to remind sales professionals that selling is still a belly-to-belly activity. The internet tools we use in our modern times are important, but all sales experts know it is how we connect with people that makes the difference. For those of us who are fans of the show “Shark Tank” you know the sharks need to do more than read the company’s prospectus. They need that face to face interaction before they can make a decision. This is true of almost everyone. People do business with those they know, like, and trust. Why hire a sales speaker for your next event? Sales is the root of all success regardless of your industry. When the topic of sales is ignored or avoided we are short-sheeting the success of the organization. This is why robust teams have sales speakers regularly come in to fine tune the team. Too often people who are planning agendas for corporate, legal, or association events shy away from the idea of putting sales and marketing on the main stage. They make excuses as to why this topic is not right for their audience, and lean towards keynotes by celebrities, economists, customer service experts, or any pancake stack of technical industry-specific speakers. All of the above are important topics, and some speakers who fall into these categories will “wow” an audience (some wont, but that is a different discussion), but if you ignore sales you are ignoring the future of everyone in the room. All organizations need to educate their people as to the value of cultivating new and repeat business if we care about job security for everyone. A sales speaker is always a good fit for every company meeting. Sales is the oldest profession (yes, sales). Without paying customers there is no company. It seems natural that businesses would realize this and champion “sales” to all employees, but they do not. Hiring a sales speaker is one of the smartest moves an organization can make for their next meeting. Those whose job descriptions do not involve responsibility for the bottom line can stick their head in the sand, but that is limiting for the whole organization. The smartest sales driven companies will help everyone realize how they can impact sales, even if their role is internal. The elephant in the room at almost all events is that sales matters to your audience. This is why hiring a sales speaker will boost the meeting experience. Let’s talk about this stuff. Finding the right sales speaker who can take an often scary topic (yes, sales is scary) and make it relate to the crowd is the hard part, but not impossible. Talk to the speakers you are considering and ask how their topics can be related to sales, or seek out sales speakers and look for how together you can customize your message to meet the needs of your audience. Sales should not frighten people, but inspire them about growing the organization. Have long conversations with your potential sales speakers. Interview them to find out what outcomes they look at providing to your team. You need motivational speakers for sales team, and not just a long boring series of stats. Sales people must be engaged, and not all speakers are good at being interactive. However, motivation alone is not really useful. But we have to remember that the opposite of motivation is to de-motivate. This is why selecting the right sales speaker is paramount to your successful sales meeting. To get a team motivated means identifying reasons for a desire to keep doing something. Thom Singer knows what his reasons are, and why he works so hard as a professional keynote speaker. His presentations are customized and highly interactive, which allows everyone on your sales team to figure out their own path to success. Make Your Next Sales Meeting The One Everyone Remembers. The sales speaker you select has to customize the content to meet your team’s needs. People will remember the meeting and put the ideas into action if they believe the message was delivered for them. Sales professionals want to succeed. But they need the right tools, ideas, and motivation. Thom Singer spent over twenty years in sales, marketing, and sales management. His stories about selling are woven into his presentation. Read about Thom’s top Sales Tips for 2019. Engage Thom Singer as the “Sales Speaker” for your next conference, sales kick-off, or team retreat. He can be booked through your favorite speaekrs bureau or directly at www.ThomSinger.com / (512) 970-0398. He is the perfect opening keynote speaker to kick off your event. Thom is a funny keynote speaker and a professional master of ceremonies. He is also the host to a popular entrepreneur podcast, “Cool Things Entrepreneurs Do” (subscribe today on iTunes). PS – Thom Singer wants to be your sales speaker for your next company meeting. Call him today to explore the objectives of your meeting and see if he is the right speaker to inspire you sales team. Your sales professionals and your team have potential. There is a path across the gap to performance, but it is unique to your company.